There are positive aspects to the plan. Three stand out in particular. The plan envisages 230 kilometres of continuous bus priority. This would make it easier to get into the city on public transport reducing congestion, travel times and the carbon footprint. The plan promises 200 kilometres of cycle lanes to make it easier and safer to move by bicycle. Again this is a welcome development in a city that currently lacks proper cycle infrastructure. The plan envisages a new low emissions fleet of buses to further reduce the environmental impact of travelling around the city. All of this sounds extremely positive, but to implement it properly, there will need to be significant investment. Unfortunately the National Transport Authority and successive governments have severely reduced the funding that has gone to Dublin Bus. Here are some important facts. Public investment is falling. In 2008, Dublin Bus got €85 million to operate its services – a figure which represented one of the lowest subsidies in Europe at the time. This was then cut every year until 2015, when €57.7 million was invested. Last year, even as the traffic chaos increased and more people travelled by bus, the subsidy was reduced again to just €47 million. The number of buses has been reduced. In 2009, there were almost 1,200 buses in the Dublin Bus fleet. This fell to 914 in 2013, and has only recovered to 1,016 this year –despite the fact that there are more people travelling on the system than ever before. Even if the promised increases in buses materialise under the Bus Connects plan, Dublin Bus will still have less buses than it had in 2009. The NTA are privatising routes. This year over 10% of Dublin Bus routes have been given to a private company from England (Go Ahead) with an appalling record in providing train and bus services. More shocking still, is the fact that Dublin Bus made a cheaper offer to provide these service but the NTA took the more expensive option to increase competition, and, in the long run, reduce terms and conditions in the public service. The NTA have increased traffic congestion. The NTA have increased traffic chaos with the Luas cross city. Figures released by Bus Connect confirm that Dublin Bus carries 67% of all Dublin passengers with only 18% taking the Luas. Despite this, some bus services have been diverted away from College Green to facilitate the Luas. The NTA knew the Luas line would have a dramatic effect on bus users but went ahead with the project anyway. There are also problems with the plan as it is envisaged. Below we outline some of the most important ones. The plan will not benefit all passengers as is claimed. The new plan promises to replace infrequent bus services with local services which bring people to high frequency services into the city centre. But this is only partially true. In many cases an infrequent service to the city centre is simply replaced with an equally infrequent service that links to a route that continues onto the city centre. For example – The plan replaces the 27a that travels into the city from Dublin’s Northside every 30 minutes with a new route, 279, that operates every 30 minutes. However, this will just link the area to the Malahide road where people will have to transfer to another bus to get into the city. The plan will create hardship for vulnerable service users. Bus Connect promise a more efficient system, but in many cases the new plan will mean great hardship for people with mobility problems. Jarrett Walker, the consultant who devised this plan, admitted that many people, including older passengers might lose out. [Box] He previously stated – How will this affect older people and people with disabilities? There is an unavoidable tension between senior and disabled needs – which are much more inconvenienced by interchange – and everyone else, and a network designed solely around senior/disabled preferences for minimum walk and interchange is simply too slow to be useful for the rest of the population. Again, attention is being given to making interchanges as convenient as possible, including for people with limited mobility, but a balance must be struck. The plan may not reduce journey times. Bus Connect claim that, overall, people will get to their destination quicker as they transfer to higher frequency routes. But again this is only true in some cases. In many others, the transfers may be to less frequent routes or to routes that don’t go the way the old network did. This means passengers will need to transfer to two or more routes to get to where they want, disadvantaging less mobile users. For example the current route 122 service from Drimnagh via the South Circular Road is scrapped completely. A lot of elderly people currently rely on this route. To access a bus service under the new plan, passengers will need to walk to the Crumlin Road and take a service to Dolphins Barn where they will need to transfer to another service to access the South Circular Road. If they wish to travel to Wexford St like the current route, they will need to transfer again. The plan often just renames existing routes. 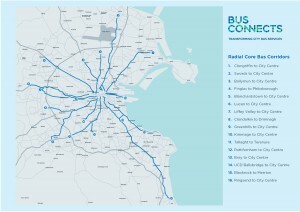 Bus Connect have hyped seven new “Spines” routes on which they claim buses will arrive every 5 minutes. But in most cases these “Spines” are simply a renaming of existing high frequency bus corridors. So, for example, the new “D” route simple renames the existing service that sees a number of high frequency routes such as the 27, 15, and other services using the Malahide road. Similarly the new “A” route already has high frequency services on it like the 41, 16, and 13. In other cases the plan merely diverts existing services out of estates and keeps them on main roads. For example, the 79 route is renamed the “G” route and is taken out of the lower end of Ballyfermot. People here will have to walk for 10/15 minutes to access the bus service that use to take them to the city centre. Major working class areas will not have direct access to the city centre. Mass population areas like Tallaght and Clondalkin will not be included in the 16 radical routes meaning that the people who live there will not get the priority bus corridors or cycle lanes. There is no planned reduction in fares. In order to make public transport attractive the new plan should cut fares dramatically. In our last pre-budget submission, People Before Profit advocated cutting fares by 50% in a bid to reduce the dependency on cars and the amount of traffic congestion. This is an important step, but one that will not be taken by the current plan. The government backed plan promises some important benefits, but insists that older people, people with disabilities and some communities may have to lose out for the city to get a modern, efficient bus service. This is nonsense. A clever redesign of the bus network is not going to solve problems caused by years of underinvestment and past cuts in services. Forcing old people to make multiple transfers will not mean a better service for others. The cause of existing delays and traffic chaos is too few buses on congested roads and fares that are too expensive. Much of this has been the result of the actions and inactions of the NTA and the Government. The new orbital routes planned for in Bus Connects. A massive increase in the Dublin Bus fleet to at least 1500 buses; this is well beyond any number planned for in Bus Connects , which only plans for a 10% increase in the existing bus numbers. Reduced fares by 50% to encourage people to use buses. The retention of all existing bus routes and services; No community should lose an existing service. An end to the policy of privatising bus routes and competitive tendering. This only lowers wages and conditions of workers and does nothing to improve services. The National Transport Authority (NTA) has now published a report by US transport consultancy firm, Jarret Walker, that drastically overhauls Dublin Bus. The claim is that this will significantly improve connectivity and frequency. However, reading the small print we see that this is simply a re-rationing of Dublin Bus’s existing stock, which will actually worsen the service in the suburbs. 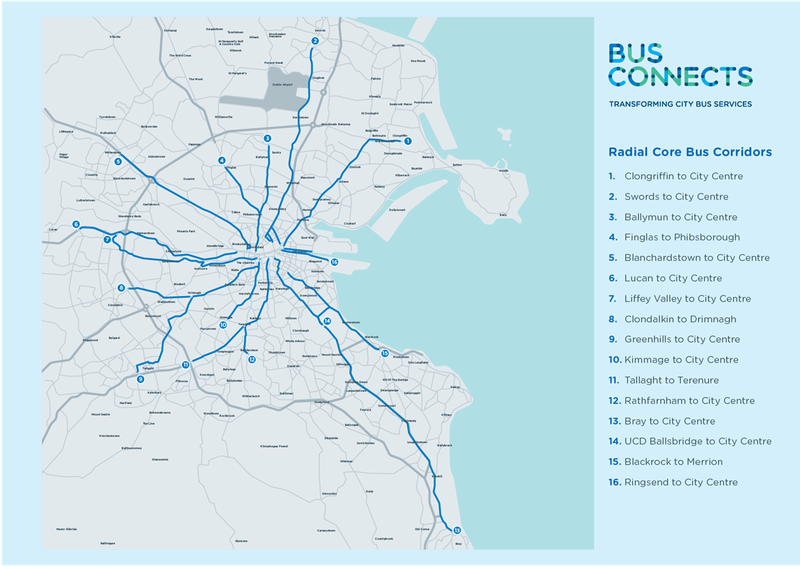 The proposed plan is based around establishing eight ‘spine routes’ which will have, it is claimed, a significantly higher frequency, serving new ‘bus hubs’ in the main population centres, like Swords, Blanchardstown and Tallaght. These will be supplemented with additional orbital, east-west and feeder routes to serve nearby communities. Over 200,000 commuters in total use Dublin Bus to travel into the city centre each day. Under this new plan, tens of thousands will be obliged to get two buses. They will be forced to get a local bus from their community to one of the main ‘bus hubs’, where they will have to get off and wait for another ‘spine’ bus to take them into the city centre. The madness of this idea is clear to everyone, except the NTA. Thousands of commuters arriving in the same place scrambling to get on a bus going into the city centre. Imagine what it will be like for parents with buggies, wheelchair users and those with reduced mobility? Already the proposal has provoked outrage among commuters. They correctly see this as simply re-rationing existing stock and another step down the road towards further privatisation. Such a situation will lead to the creation of an inferior transport system and attacks on workers rights. Large and angry meetings have taken place in communities across the city. Over 300 people attended a meeting in Greenhills with 600 in Drimnagh. Two hundred irate locals marched to one of the NTA ‘information stalls’ in Crumlin to register their opposition to this plan. Solidarity and the Socialist Party have organised meetings in Edenmore, Tallaght and Dublin West. While the consultation process ends on 28 September, the many local campaigns must continue to put pressure on the politicians. Many Fianna Fáil politicians are opportunistically holding meetings on the issue. They need to be pressurised into insisting that Transport Minister, Shane Ross, directs the NTA to scrap the plans. We need an active campaign in every community. SIPTU and the NBRU – who represent bus drivers – should call a city-wide demonstration to the Dáil. But this isn’t enough. Commuting to and from work in Dublin is a daily nightmare for hundreds of thousands of workers and students. The cause is chronic underfunding of and lack of capital investment in public transport. What is needed is a properly funded public transport system that is run on a non-profit basis to serve the interests of its workforce, commuters and our environment.